Critics have acclaimed Andrew Robert’s CHURCHILL WALKING WITH DESTINY as the best single volume biography of the iconic world figure. Having completed the 982 pages, read in sequence, I add my voice to the acclaim. It is a masterwork by the celebrated British historian. His commitment to exacting detail refreshes the landscape of history, while at the same time his prose is not at all cumbersome. In the bleak years of 1939-1940 when England stood alone against Hitler, Winston Churchill made one of his many inspirational speeches. “Come then, let us to the task, to the battle, to the toil-each to our part, each to our station. Fill the armies, rule the air, pour out the munitions, strangle the U-boats, sweep the mines, plough the land, build the ships, guard the streets, succor the wounded, uplift the downcast, honor the brave. Lets us go forward together, there is not a week or a day or hour to lose.” Little wonder it was said of Churchill, ” He weaponized the English language.” Roberts allows the reader to captivate the famous Churchill intonation. 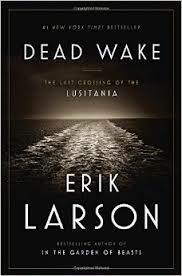 Erick Larson’s best seller Dead Wake, The Last Crossing of the Lusitania, to this reader raises as many questions about the 100-year-old story as it answers. That in itself gives weight to this great mystery and the continued interest in this often explored maritime and political disaster. Larson’s writing begs for answers to the biggest question of all. Were the British through lack of communication and direct intervention complicit in the sinking of the great ship? Was the sinking of the Lusitania necessary to bring America to the aid of the British in World War I? Dead Wake is deep in detail of the broad cross-section of the Lusitania’s passengers which at times in the narrative overshadows the disaster itself. The author’s portrayal of Woodrow Wilson’s courtship of Edith Galt places his ardent pursuit of her within his tortured indecisiveness to bring America into the War. On Friday, May 7, 1915 at 2:10 P.M. the Lusitania was struck by a single torpedo fired by German Submarine U-20. The great liner sank in 18 minutes. Over 1200 souls perished in a chaotic scene so inhuman that German U-Boat 20 Captain Schwieger lowered his periscope unable to view the calamity he had caused. On April 17, 1917, two years after the sinking of the Lusitania and three additional American ships, Wilson asked a joint session of congress to declare War on Germany. The carnage at sea, however, may not have been Wilson’s tipping point. Larson walks the reader through the Zimmerman telegram, intercepted by British code-breakers, seeking to bring Mexico into the War with the promise to bring back to that nation its former lands in Texas, New Mexico and Arizona. Larson allows Lord of the Admiralty Winston Churchill the last word. ” What he ( Wilson) did in April 1917, could have been done in May, 1915. And if done then, what abridgment of the slaughter; what sparing of the agony; what ruin, what catastrophes would have been prevented; in how many million homes would an empty chair be occupied today.” I can imagine Churchill, 35 years later, reiterating the same words to FDR as they sat in the White House on the eve of America’s entry into World War II. To delve further into the sinking of the Lusitania you may wish to read Lusitania, An Epic Tragedy, by Diana Preston.